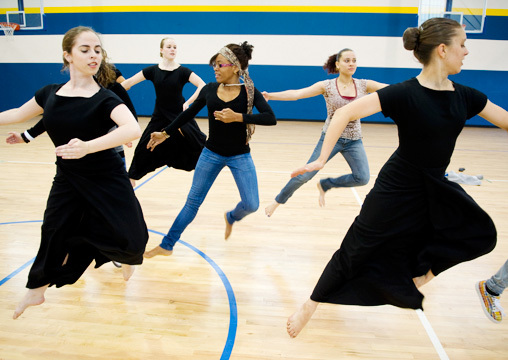 Dance professor Duane Cyrus prepared his dance students to re-stage “Steps in the Street.” Here they perform the dance with high school students at Northeast Guilford High School. Assistant professor of dance Duane Cyrus received a $15,000 grant from the National Endowment for the Arts to support the 2010 staging of Martha Graham’s “Steps in the Street.” As a choreographer and teacher, Cyrus has consistently shared his knowledge and experience through his involvement in community outreach and arts-in-education programs. Founder and artistic director of Cyrus Art Production, he has received commissions from the Greensboro Bicentennial Commission, Bricolage Arts Festival, Nannette Bearden, Noriko Hara Ballet, Masako Sakamura and the Puffin Foundation. Cyrus also was named University Dance Educator of the Year by the North Carolina Alliance for Athletics, Health, Physical Education, Recreation, and Dance.